If you want to enjoy the exceptional talent of the dancer Paloma Fantova in Madrid, only you can do in Cardamomo, the best Flamenco Show in Madrid, because she does not dance in another tablao in town. At age 7 she made her debut at the Apolo Theatre of Madrid, in Antonio Canales’ ‘Bailaor y Raíz’ [Dancer and Root]. At 8 years old, after having won the young talent show on Spanish TV ‘Premios Veo Veo’, she performed as a Flamenco dancer for the King and Queen of Spain at the Madrid Conference Centre, alongside renowned artists such as Rocío Jurado and José Mercé. At age 9 she won the Premio Revelación de Andalucía [Best Newcomer Award]. In the same year she danced with Farruquito and his family in a tribute to Farruco; she took part in the programme ‘Algo más que Flamenco’, presented by Sara Baras and Raimundo Amador; and performed as lead dancer in the company of Antonio El Pipa in the show ‘Generaciones’, in theatres in Seville, Madrid and Jerez and at the Festival of La Unión (Murcia). At the age of 10 she worked in the company España Baila. A few years later, she travelled to Japan to work on the choreographies of Japanese dancers in Manuela Carrasco’s show. In 2011 she was guest performer at Joaquín Cortés’ show Calé at the Häagen-Dazs Theatre in Madrid. In that same year, at the Coliseum Theatre of Barcelona, she danced the lead role in the tribute show to Carmen Amaya, directed by José Luis Ortiz Nuevo. In 2012 she presented her own show “Sensibilidades”, with which she toured the main theatres and Flamenco venues in American continent. Following the great success and acclaim from critics and public alike of her solo performance at the Flamenco Biennial in Seville, Paloma Fantova began to work with artists like Manolo Carrasco, Rafael Amargo and Tomatito, with whom she toured Spain, Europe and America as the only Flamenco dancer in her show “Soy Flamenco”. The following year she performed in the Cycle “Flamenco viene del Sur” [Flamenco comes from the South], alternating this with performances of her own show Estado Puro, which earned her the prestigious prize of La Venencia Flamenca of the Flamenco Festival of La Mistela (Seville). She was subsequently invited to represent the essence of Flamenco in Spain with her choreography “Estado Puro” in the XI International Dance Festival “Fragmentos de Junio” in Guayaquil (Ecuador), whose theme on that occasion was “contemporary experimental dance”. Alongside Flamenco dancers Pastora Galván and Karime Amaya, she danced in the show ‘Con Carmen Amaya en la Memoria’, produced by the El Cordobés Foundation and the Academy of Arts and Sciences of Flamenco, performing on the main stages of Spain and Europe. In summer she combined performances in her show “Estado Puro” with a tour in Tomatito’s show “Soy Flamenco” in Spain and main European cities. 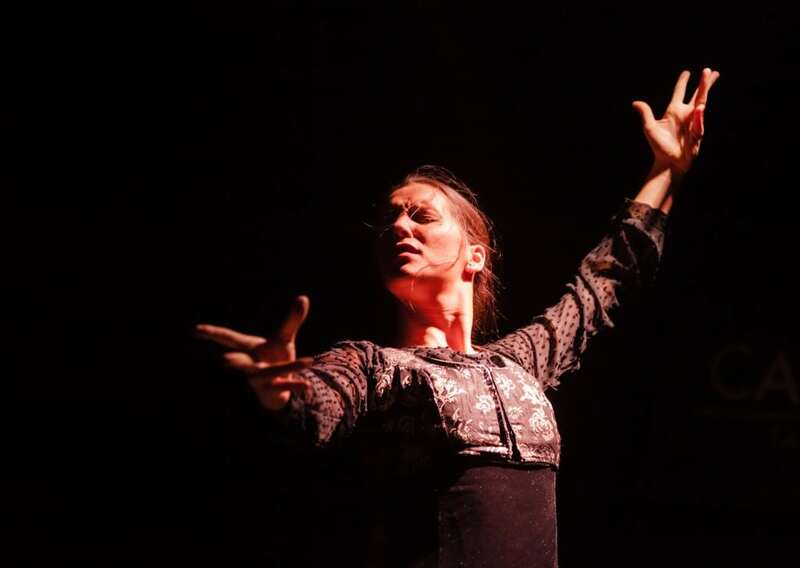 In 2014 she took part in the Biennial of Flamenco of Seville dancing in the show ‘Cuerpo, mente, alma’ [Body, mind, soul] at the Lope de Vega Theatre. Later she performed in the show ‘Flamenco Universal’ alongside guitarist Pepe Habichuela and flutist Jorge Pardo, which made its debut at the UNESCO headquarters in Paris on occasion of the 4th anniversary of the declaration of Flamenco as Intangible Cultural Heritage of Humanity. Until 2015 she has had an intense work schedule: touring the US and Latin America with Tomatito; in March 2014 she performed at the Heineken Jazz Fest de Puerto Rico, at the Rose Theatre of New York, at the Palace of Fine Arts Theatre of San Francisco, at the Festival of Flamenco in Washington DC; in April she performed at the 63trd International Festival of Music and Dance in Granada.